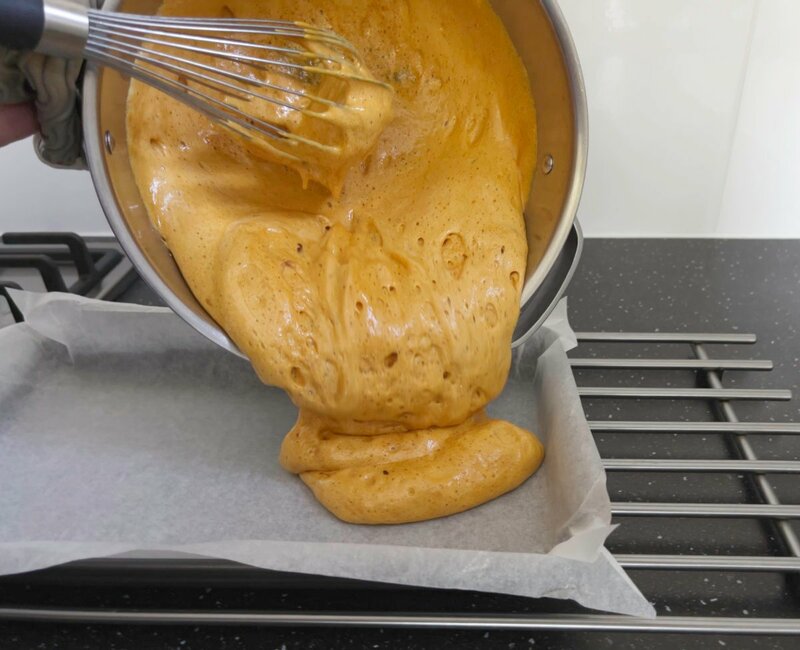 Halloween and Bonfire Night are fast approaching so I thought I’d share my Kitchen Shed Tips to help you make the best and crunchiest honeycomb … although getting here wasn’t as straightforward as I’d hoped. Last year I offered to make the favours for a family wedding where the brief was to make a sweet treat suitable for adults and children. 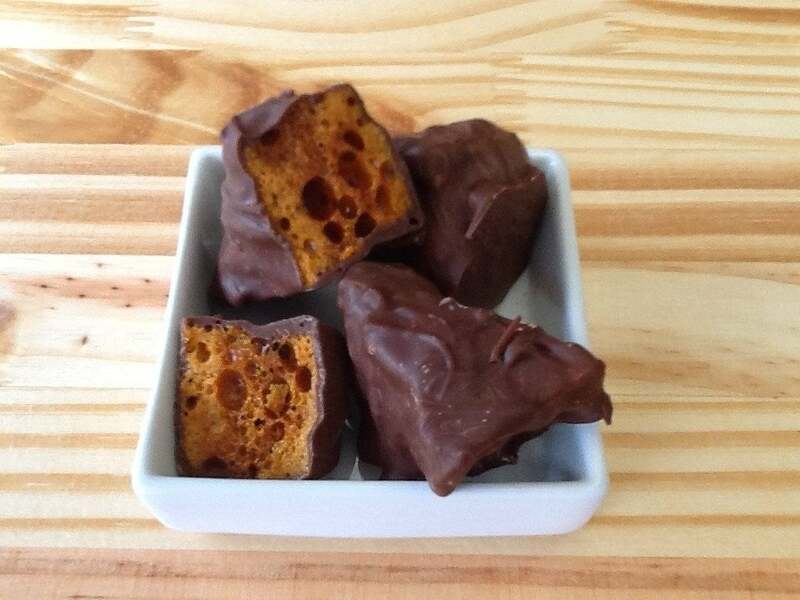 My suggestion of honeycomb went down well with the wedding couple as we all thought everyone loves a crunchy honeycomb, especially if it’s covered in chocolate. Naively I thought it was simply a matter of a quick practice run and all would be good to go – how wrong I was ! It’s fair to say I had a few confectionery crises as initial attempts were too sticky and then too hard and I imagined queues of wedding guests outside the dentist’s surgery. The responsibility of the task was beginning to dawn on me and I was so relieved I hadn’t offered to make the wedding cake. To avoid you completely losing interest (or maybe falling asleep) I’ll spare you all the disaster details but after a few more attempts I came up with the final recipe. 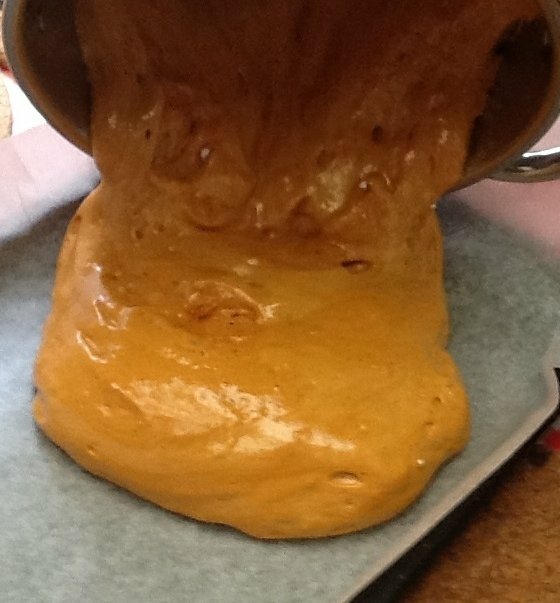 Just enough bicarb to make the honeycomb nice and airy but not bitter, no water to get a better caramel and all heated to just the right temperature to ensure a honeycomb which doesn’t pull out your teeth. 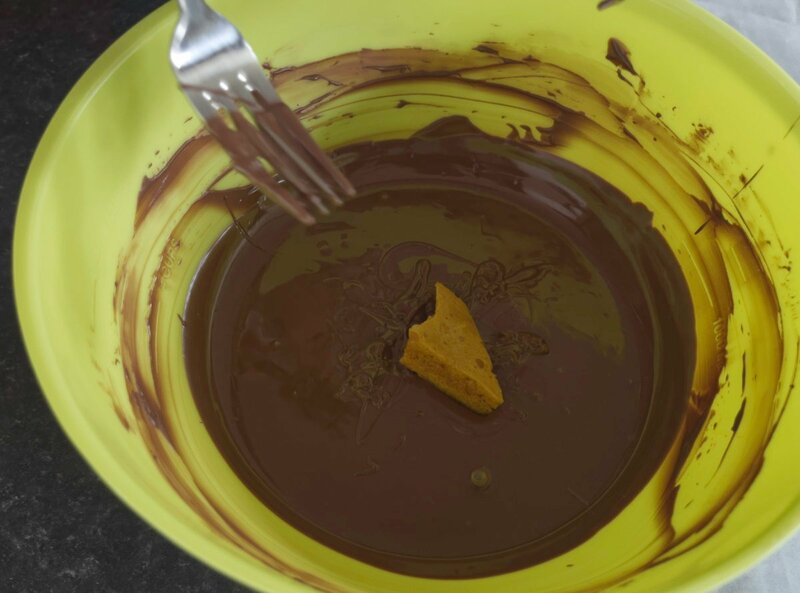 Next step was to make at least 400 pieces of perfect honeycomb and coat them with tempered chocolate. 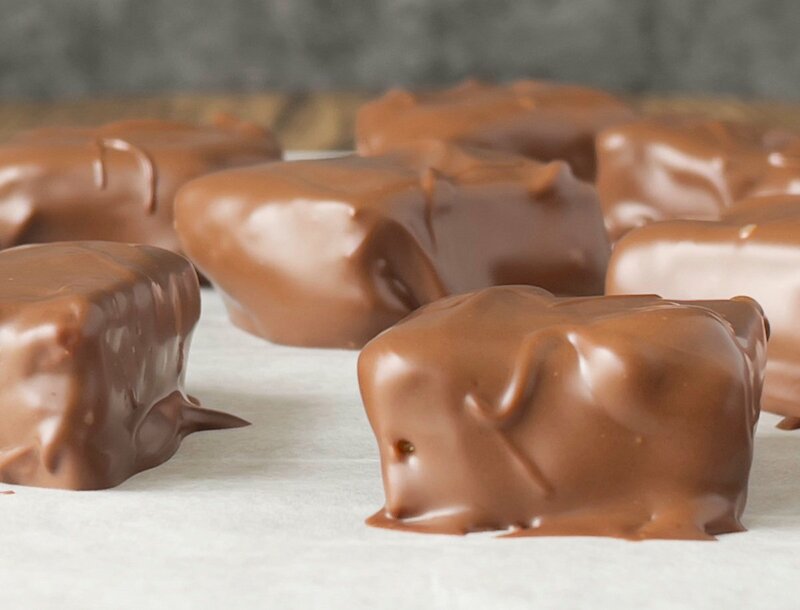 We set up a family enlisted production line with me making the honeycomb, OH breaking it into pieces and then a joint effort where we coated the honeycomb with chocolate. 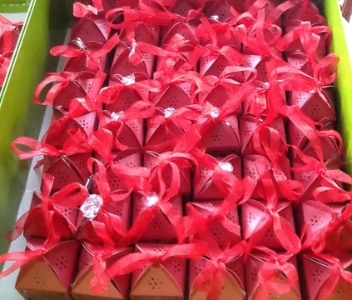 Once the chocolate honeycomb lovelies were transported to The Kitchen Shed UK production facilty, our nephews helped assemble the eighty five tiny boxes, honeycomb pieces were counted, wrapped and boxed before tying off with a ribbon bow – don’t the boxes look cute ? My first ever wedding favours were ready and I treated myself to a huge sigh of relief. The feedback later that day made all the last minute honeycomb panic worthwhile. The wedding couple loved the favours and I even got a request to make favours for another wedding. The biggest surprise of the day for me was the nostalgia the honeycomb evoked; it was lovely to hear guests reminiscing and sharing their childhood memories of Woolworth’s chocolate honeycomb. I also discovered that “Crunchie” (as we know it) was my Dad’s favourite childhood sweet, something he’d never shared with me. My Dad can remember eagerly awaiting the ration coupons and then rushing up to the sweet shop on the corner with my Grandma where they’d use up their whole month’s sweet and chocolate ration in one go on four bars of chocolate covered honeycomb. I can just picture that little boy of five or six with his mum. 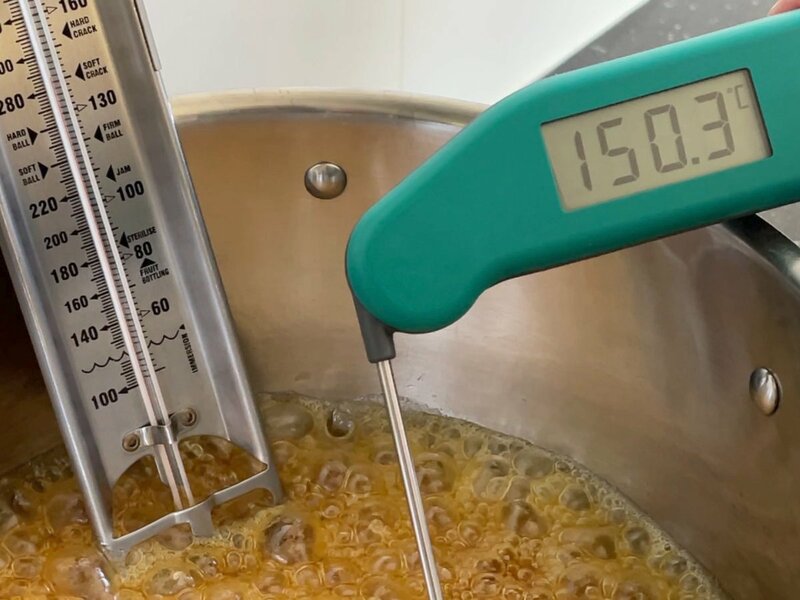 If you want honeycomb to be perfect and not soft, teeth breakingly hard or bitter you really do need to use a sugar or jam thermometer. 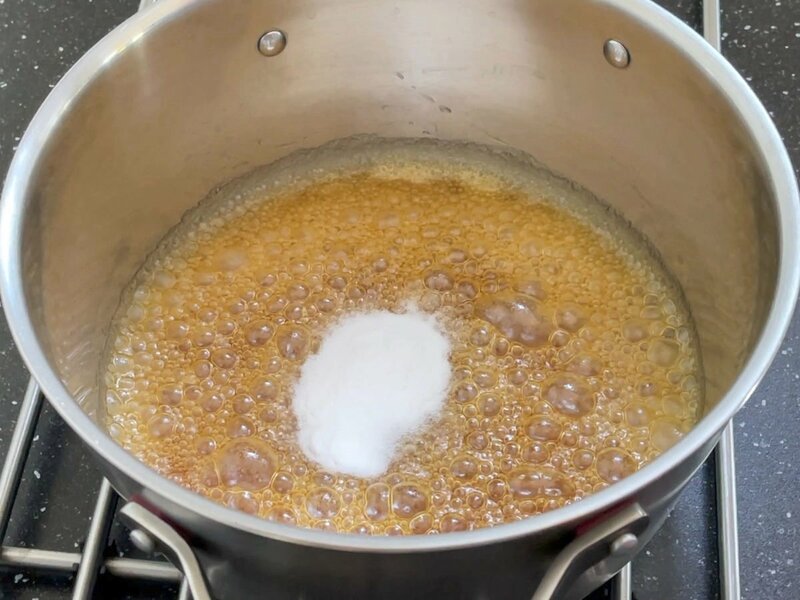 Cane sugar is easier to work with and the addition of golden syrup helps to prevent crystals forming. 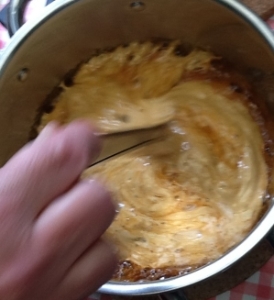 Add the sugar and golden syrup to the pan and attach the thermometer to the side of the pan. Place on a gentle heat and stir gently until dissolved, try not to let the mixture bubble until completely dissolved. Do not stir once the sugar has dissolved or it will crystallise. As quickly as you can take the pan off the heat and remove the thermometer. Be careful you don’t want to burn yourself with hot caramel. Tip in the bicarbonate of soda and gently whisk in until it has all disappeared and the mixture is foaming, taking care not to overdo it. Pour out gently into the lined tin, pouring as near to the bottom of the lined tin as you can so you don’t lose those lovely bubbles. Carefully scrape out the last of the mixture with a silicone spatula. 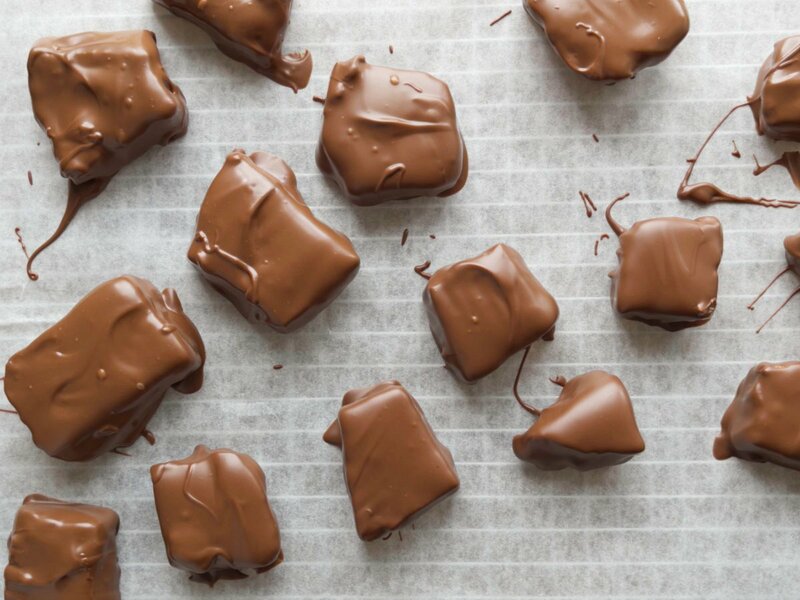 Leave to cool before cracking into chunks. Store in an airtight container, glass works best, I’ve stored ours in Le Parfait jars for 3 months and they were still crisp. Easy Clean - Immediately fill your empty pan with hot soapy water and leave for a few minutes before washing. Honeycomb is delicious in ice cream, crumbled on the top of chocolate cakes or cupcakes. How do you use yours? Credit Crunch Munch created by Camilla from Fab Food 4 All & Helen over at Fuss Free Flavours & hosted this month by Camilla. The Teatime Treats Challenge hosted by Karen over at Lavender & Lovage and Janie at The Hedgecombers, hosted this month by Karen. Treat Petite hosted by Stuart over at Cakeyboi and Kat at The Baking Explorer, hosted this month by Cakeyboi. Hi Linda, I’ve been making honeycomb this week and yes it does lose some height, a bit like when a sponge comes out of the oven. You don’t want the holes in the honeycomb to be too big as the honeycomb shatters when broken and is hard to keep in pieces. Hope this helps, please ;et me know how you get on. My family has a multiple birthday afternoon today and my son has made your honeycomb for gifts. I had to help him to pour it out as he kept squishing it down with the spatula – but it turned out lovely. Thanks so much for the memories of my own childhood when I used to make it! 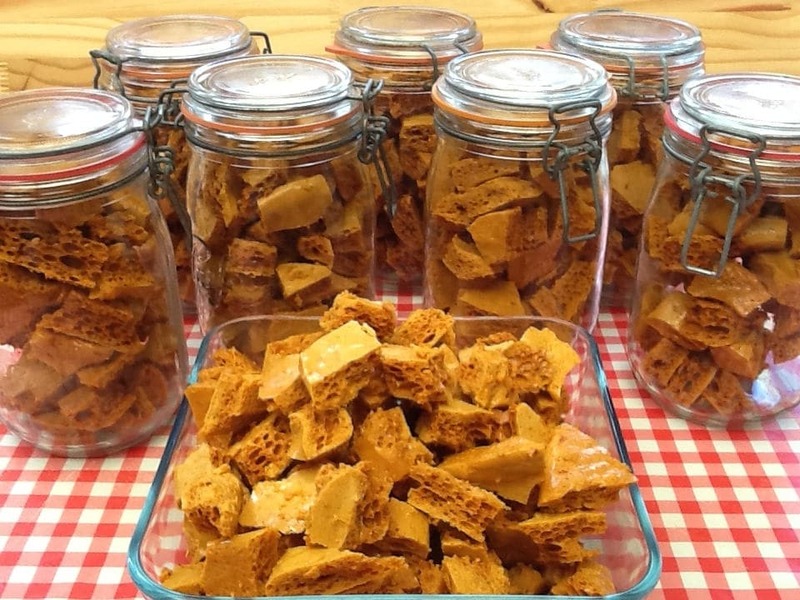 What a lovely idea, I’m so pleased making the honeycomb with your son brought back happy childhood memories for you. so excited to try this later today, my honeycomb recipe always loses so much height as it is cooling and is so thin! this looks awesome! Thanks Naomi, do let me know how you get on and I hope my tips help you to keep a nice height to your honeycomb. Can you add pecans to the honeycomb? 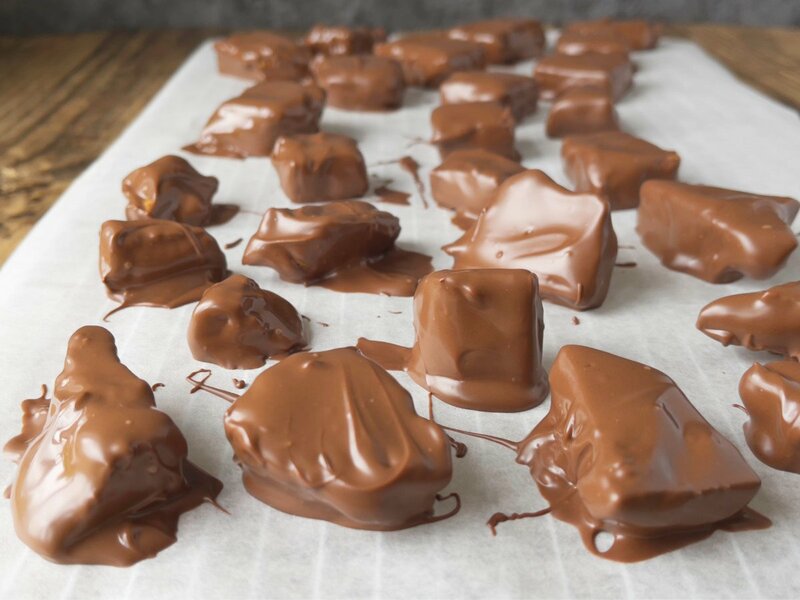 If so would you have the pecans laying out on the sheet pan when you pour it out or can you add them to the mixture becore pouring onto the sheet pan? Hi Cheryl, I’ve never tried adding nuts to the honeycomb but the mixture is quite sensitive. 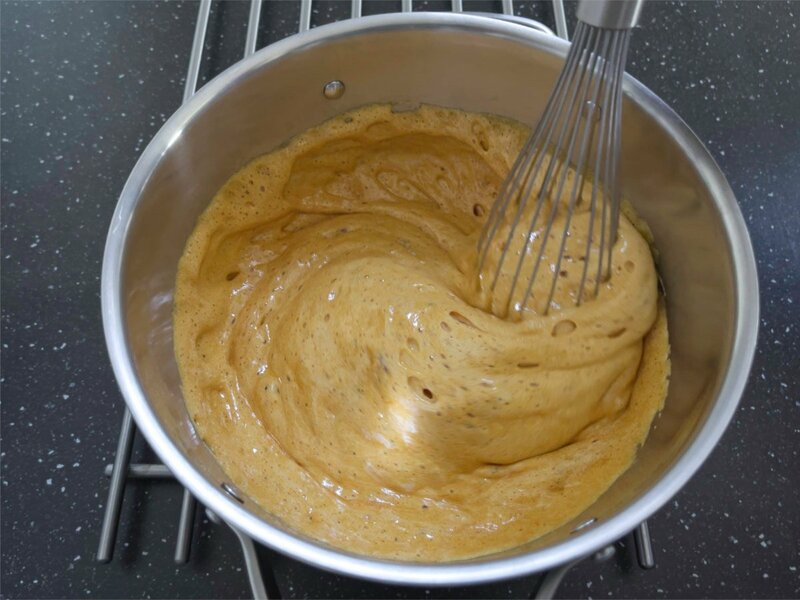 For instance, if you whisk the mixture too much or don’t pour it onto a tin quick enough the mixture loses air and a good honeycomb structure so I wouldn’t recommend adding at the mixing stage. To be honest, I’m not sure whether the pecans would affect the structure if they were placed on the sheet first before covering with honeycomb. 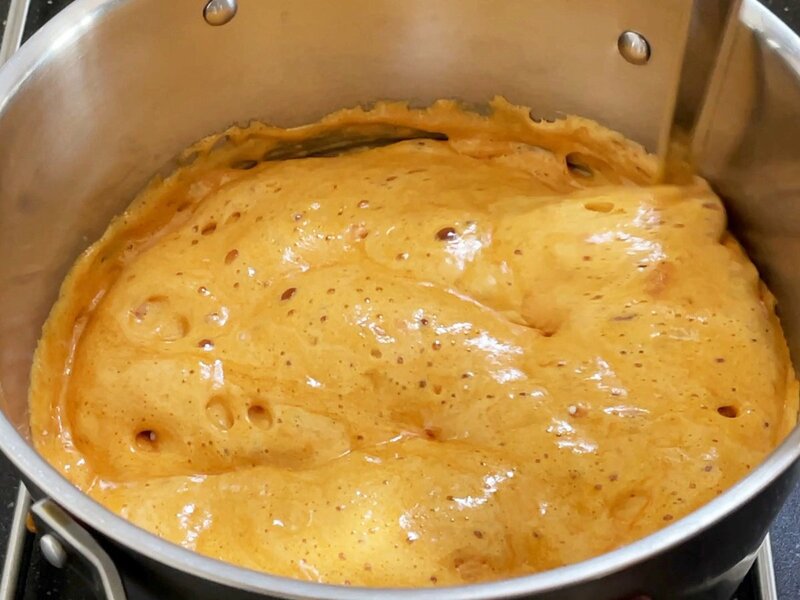 I did a quick search on Google and there is a recipe for peanut brittle honeycomb that adds the nuts with the sugar before the bicarb is added. However as I’ve said I’ve not tried a nut honeycomb before so I wouldn’t be able to say it works well. Sorry I can’t give you a definitive answer but I hope the information is useful and do let me know if you try it with pecans. Just came across your recipe. My girls love this candy, but it’s oh so expensive here. Will definitely be making these for them. Thanks for posting for us all to enjoy. In the US we call it angel food candy. Thanks for the information Doris, what a lovely name for honeycomb. Hey i don’t have a thermometer how long should I biol it for approx? Hi, thanks for stopping by. It’s not necessarily the amount of time you boil the sugar for as this depends so much on the pan used or the heat. 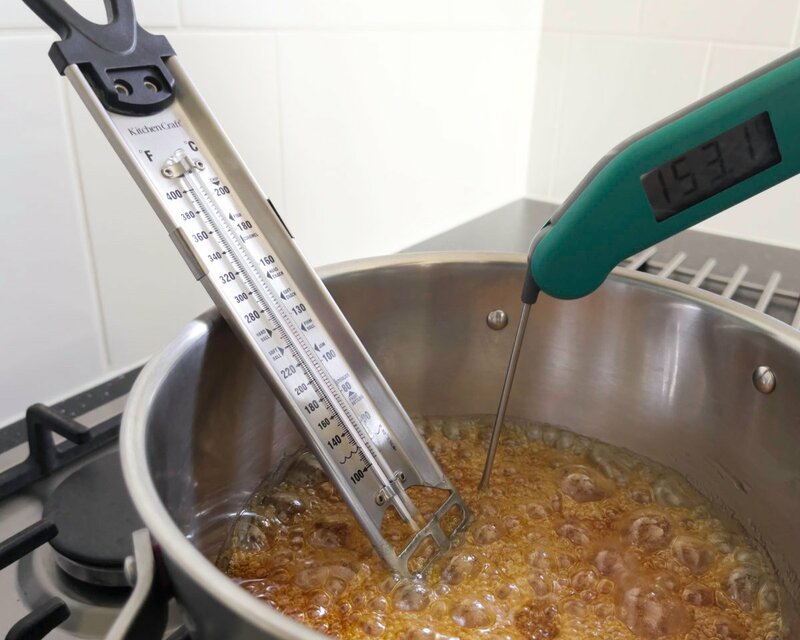 The best way without a thermometer is to wait until it turns a golden caramel colour, you also might notice the sound of the mixture bubbling away disappears. 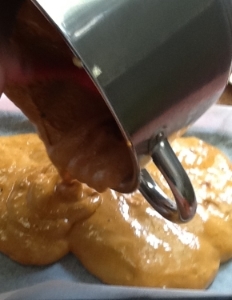 Be careful not to let it go too far as the caramel will turn bitter. Hope this helps, let me know how you get on. Hi, I am from the USA and was wondering what is Golden syrup? I’m an expat Brit and buy my golden syrup from amazon.com. You can use corn syrup, light or dark,but frankly the flavour is just not there. Personally, my apologies to my American friends, I don’t really care for corn syrup, it has all the qualities one needs in baking but brings nothing flavor wise to any baking project; it’s so worth spending a few extra $’s to keep golden syrup and occasionally treacle in, although molasses are almost a substitute, just more liquid than treacle I have found. My 2 penneth worth! Thanks for the info Elizabeth, having never tried corn syrup it’s useful to get some feedback from someone who is able to compare the two side by side. It’s good to know you can get hold of golden syrup in the US. Hi can you please clarify for me is it 175g or 1 3/4 cups of sugar because there is a big difference 175g is more like 3/4 cups. Thanks Shannon, I’m so glad you noticed, you are right, 175 g is 3/4 cups. I’ve amended the recipe today, thanks again for popping by. 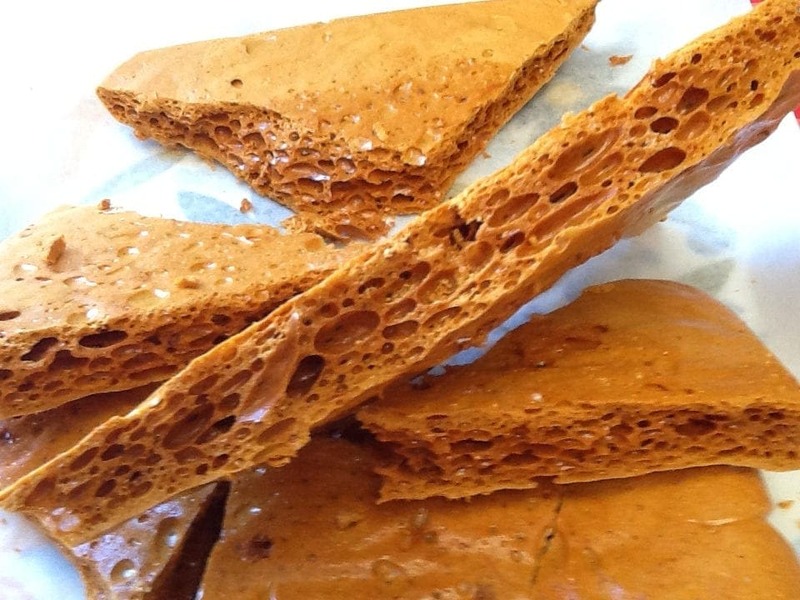 Hi Sarah, I love homemade honeycomb and first started making it as a teenager (with very varied results). I think it makes a lovely gift (especially as honeycomb can only be bought in the summer in the form of Cadbury’s crunchies – your Dad has good taste). Your honeycomb has larger holes than the stuff I make (which I would prefer), so next time I’ll try your recipe out. 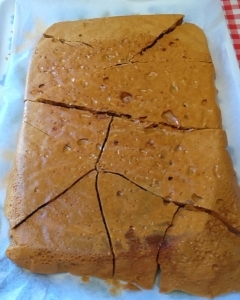 Hi Sarah, I made the honeycomb yesterday for my sons birthday tomorrow and I can vouch that it is good! Going to cover it in chocolate today to finish it off…. Just hope there is enough left for tomorrow. Definitely going to use these tips when I try honeycomb again as my first try was not that great. Thanks for entering into Treat Petite! Lovely memories from your dad and so glad you persevered to achieve this great success. I have only attempted Honey Comb once from a hastily scribbled down recipe after watching Nigella make it, think she called it Hokey Pokey, well served me right for not making it right away but several years later, I can’t even remember what was wrong with it, could have been a soggy mess! This is lovely Sarah! I do know exactly what you mean about pulling teeth out I am increasingly nervous of my fillings and sweet sticky chewy sweets these days. 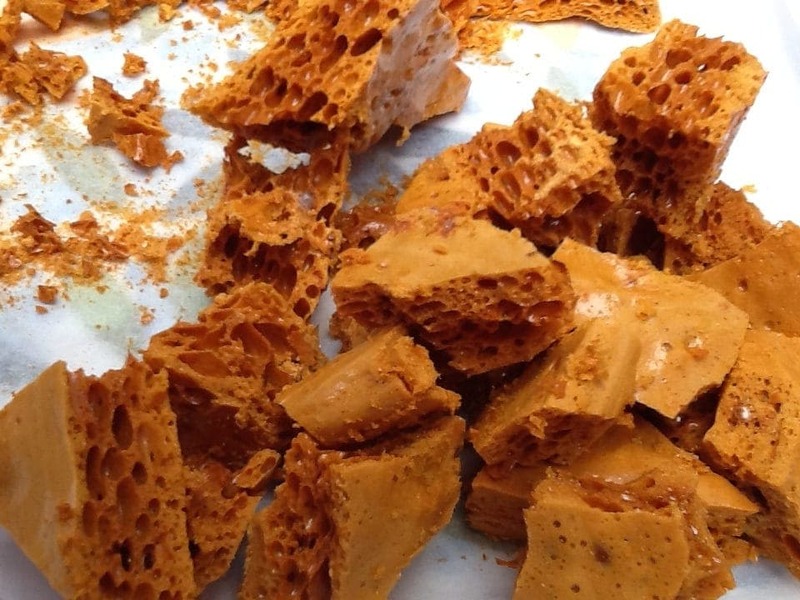 I love honeycomb – and will be making some. Oh my, I LOVE honeycomb and this has me drooling!! And I just have to be honest now… I had NO IDEA honeycomb wasn’t anything to do with real honeycomb!!! I love honeycomb; can’t believe I can now make it. You, lady, are a generous beyond measure. What an absolutely beautiful offer to make these for someone else’s wedding favors. Such a beautiful present, and yes, now hundreds of people with treasured ‘crunchy’ memories. 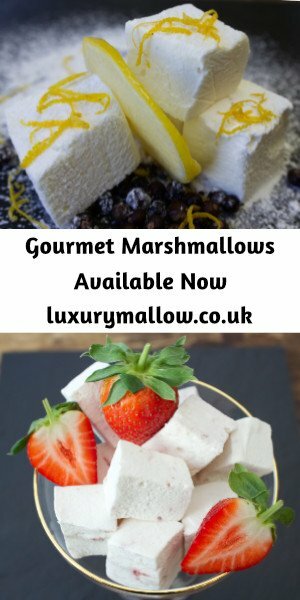 Thank you so much for linking to #CookBlogShare… I will be making these very soon! How did I not know that you could actually make honeycomb?! This looks fantastic and kudos to you for trying it and having it come out so beautifully! It’s such a great idea for a wedding favor as well – I remember Crunchie as well and have some serious nostalgia right now. Happy FF and thanks for bringing it to the party! Thanks Judi, I think I need to brush up on American names for honeycomb, maybe you’ve come across it as puff candy or crunchie? I never saw an edible honeycomb ever. It’s too good. Thank you, it is rather addictive. I don’t think I’ve ever heard of homeycomb? Your little wedding favors are just perfect, and I love that they are bite size. Perfect for the holidays! Thanks for stopping by Julie. I think honeycomb is referred to as puff candy in the States, maybe I should link up with both names to avoid confusion. I LOVE honeycomb!! I could eat it all the time especially coated in chocolate! I love how big these look 🙂 I need to try out your recipe. I’ve never made honey comb before but it’s definitely on my to do list. I too would have thought that it was a straight forward thing to make so thank you for sharing those fabulous top tips! Pinning for later. 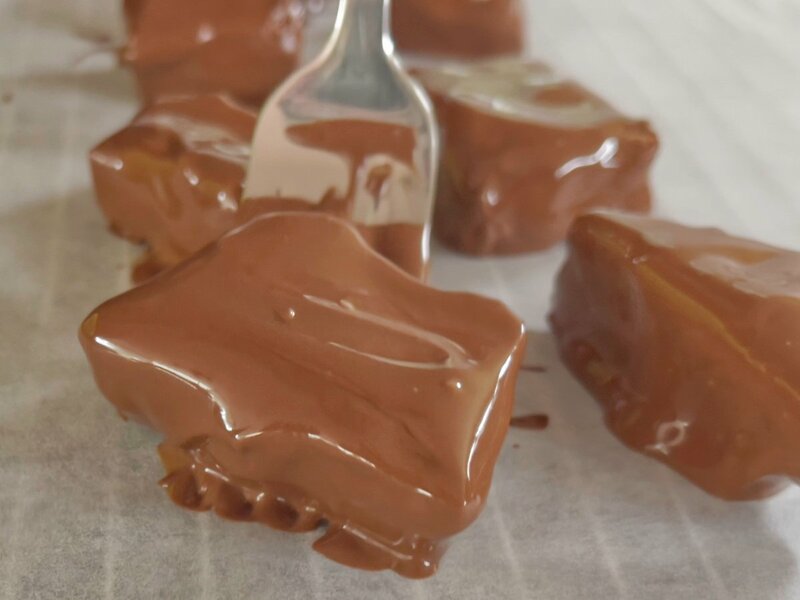 We tried making this a while ago with honey and it was atotal disater, I’ll be trying your recipe with the girls today as we were onlt talking about trying again yesterday!! Don’t you just hate those moments when you do something you think will be easy only to discover that it’s far trickier than you first though – even worse when you’ve promised someone you’ll do it! It definitely looks as though all of the hard work paid off in the end and you honeycomb looks perfect and so pretty in the little boxes. 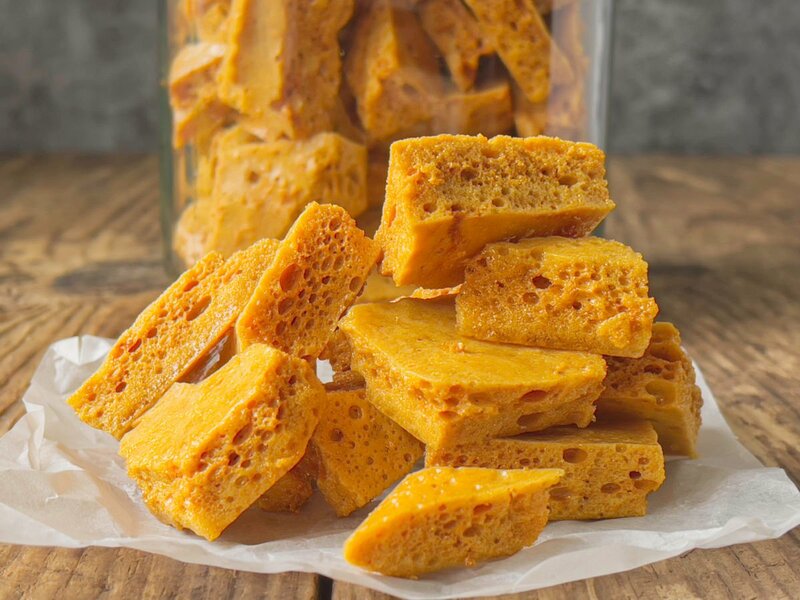 I should really be getting off to bed now, but I’m so tempted to head into the kitchen and make honeycomb instead – would that be wrong? Thank you, sharing everyone’s childhood memories of chocolate honeycomb made all the effort worthwhile.